Grand River Technical School and the city of Chillicothe, along with other local entities, hosted a welcome reception for Dr. Lenny Klaver, president of North Central Missouri College, Wednesday morning. The reception took place at Grand River Technical School and was hosted also in part by the Chillicothe Area Chamber of Commerce and the Chillicothe R-2 School District. Klaver joined NCMC as president in May. Jayme Caughron, GRTS director, introduced Klaver to those in attendance and stated that the school values its partnership with NCMC. Among the largest benefits of that partnership is the agreement between the schools through which a GRTS student who meets certain grade and attendance requirements can get articulated credit, up to 30 hours, at NCMC. Through this agreement, a student can earn an associate's degree after just after one year attendance at NCMC. The partnership also allows the schools to share resources. Before arriving in Trenton, Klaver most recently was the vice president for institutional advancement at Finlandia University in Hancock, Michigan. He earned his doctorate in Educational Administration from the University of Northern Colorado. His bachelor's and master's degrees are from Wayne State College in Wayne, Nebraska. Klaver is from central Iowa and said he is "still a rural kid at heart" and wanted to return to the Midwest. His first degree was earned from Iowa Central Community College. "My best experience ever as a student was at a community college," he said. Upon arriving at NCMC, Klaver said he was impressed by the students. "I am very impressed with their genuineness, and that so many of them know what direction they want to go; and, also, how willing they are to take advantage of the leadership opportunities we have available." 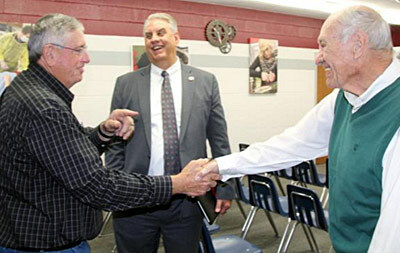 Mayor Chuck Haney (right) following brief remarks during a reception at GRTS. Benefits of NCMC include the A-Plus program, small class sizes so that students can know their professors as well as other students on campus, and the school's affordability. "It's the best value," Klaver said. He also made note of the school's faculty. "The folks in our classrooms are teachers. They are really excellent in the classroom," he said. "We are about teaching. We're not about having a teacher's assistant, or graduate assistant, or teach one class and spend 90 percent of their time in research." Klaver noted the quality nursing, agriculture, business and education programs and said that the school would like to expand its applied technology degree program. He said that the school is also looking at developing "fast-tracks" in manufacturing areas that would offer course work for workforce readiness. He said the courses may be non-credit classes but that they may transfer into stackable credentials that do amount to credit if students enter a formal program. Klaver said that the school has a forward-thinking approach and credited former NCMC president, Dr. Neal Nuttall, for fostering that quality. "We tend to have an institutional intuition to look forward to meet the needs that are coming," Klaver said. "A lot of times in higher education you see the most brilliant people are the slowest to want to change. I find that at the community college level and working with the technical schools and the high schools in the area, that we are very forward thinking." "The students that are graduating today are preparing, many times, for jobs that don't exist yet," he added. "They are jobs that are going to change because of technology. They are jobs in the sectors where a certain way of doing work, like in manufacturing, has changed from very physical labor intensive to technology based jobs." North Central Missouri College serves a broad base of constituencies across a 16-county region, Klaver said. In addition to Trenton, the school has locations also in Bethany, St. Joseph, Maryville, Brookfield and Chillicothe. "We'd like to continue to expand those reaches a bit," Klaver said, while assuring those in attendance that the school will stay based in Trenton. NCMC's mission statement calls for the school to provide accessible, affordable and quality educational programs with an emphasis on excellence in teaching, learning, workforce development and services. The school vision, Klaver said, is to aspire to be an exemplary, comprehensive community college serving rural and small communities in its service region and beyond. "We want to be top of mind awareness as a college choice," he said. "Not a fallback choice." He said that the community college can be the right choice and a good fit for many students, noting that college's tremendous debt can be considerably lessened by going to a community college "where you know your credits are going to transfer, where you know you are going to get excellent instruction, and where you will have a good experience." He concluded his remarks by reflecting on the importance of the partnership with the Chillicothe community and GRTS. "I hope you continue to show interest in NCMC,”" he said. "I hope we have nothing but a great future in working together."